To observe the changes in the quantity and morphology of mechanoreceptors in different-state remnant stumps of ruptured anterior cruciate ligaments (ACLs). Specimens of completely ruptured ACL remnants were collected from 57 patients. The injury time from injury to surgery was recorded. According to the degree of pre-operative anterior displacement of knee joint, these patients were divided into two groups: group 1 (≤ 6 mm) and group 2 (> 6 mm). The morphology type of ligament remnant in each patient was identified. 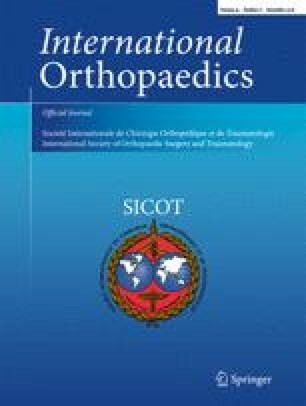 The correlations of mechanoreceptor number in the remnant stumps with the morphology of ligament stump, injured knee stability, and injury time were analyzed. Subsequently, based on ACL lesion type, patients were divided into four groups including groups A, B, C, and D, and then, the items above were compared among the four groups. Group 1 contained 20 specimens including three with type B and 17 with type C. Group 2 contained 37 specimens including 20 with type A, 1 with type B, 2 with type C, and 14 with type D. The distributions of four-type remnant morphologies (X2 = 49.406, P = 0.000) and mechanoreceptors (X2 = 13.84, P = 0.002) were all significantly different between the two groups. The number of mechanoreceptors was positively correlated with the injured knee stability (r = 0.63,P = 0.018). The number of the mechanoreceptors was not obviously correlated with the injury time in group 1 (r = − 0.37,P = 0.136), while it was negatively correlated with the injury time in group 2 (r = − 0.51,P = 0.022). There was a significant difference in pre-operative anterior displacement of knee joint among groups A, B, C, and D (F = 85.59, P = 0.000), and the pre-operative anterior displacement of knee joint was less in groups B and C than in groups A and D. There was a significant difference in the distribution of typical and atypical mechanoreceptors among groups A, B, C, and D (X2 = 68.16, P = 0.032). The ruptured ACL remnants connecting the femur to tibia can still play a role in maintaining knee stability; thus, the mechanoreceptors can persist in these remnants for a long time. This study was supported by grants from the Natural Science Foundation of Liaoning Province (no. 20170540998). All study methods were approved by the Ethics Committee of Shengjing Hospital of China Medical University. All methods were performed in accordance with the relevant guidelines and regulations.